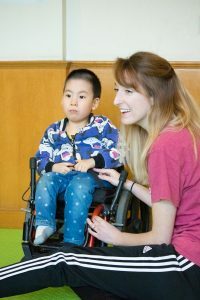 We recently had an opportunity to visit two of our special kiddos, Anthony (Han Qianjian) and Levi (Han Qiannan). Both boys had grown so much since we’d last seen them in the summer! They were both very playful and were so happy to see us. Levi seemed to especially enjoy riding on the back of our OT Katy as she pretended to be a horse on all fours. While there, our therapy team noticed that Anthony’s back had gotten bigger and recommended he go to the doctor to have it checked. We were also able to have a look at Anthony’s wheelchair and encouraged the ayis to allow him to use it as much as possible as this will be a great benefit to him.